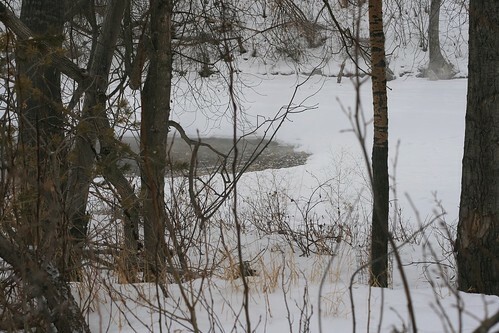 So it’s been a while: it’s the middle of January, and the last time I posted was Augustish. I could talk a lot about why I didn’t post (the end of the year was busy, I guess? ), but I don’t know how useful that would be. It’s been a while, is all. One of the things I learned from not blogging for so long, though, was that I miss it. I didn’t think it was that important to me to have photos of all of my projects, or to have my Ravelry page up to date, but as it turns out: it is. I’ve noticed a change in how I feel about creating, and how I feel about what I’ve made, when I don’t have a visual record to go back to. There’s something really satisfying about it – as a made thing in and of itself, I guess – and I find it helps me a lot when life gets busy. When things are hectic, or when I’m travelling too much to have time for some of my less portable work like spinning and sewing, one of my instinctive thoughts is that I’m not making enough. Sometimes this is true, sometimes this isn’t. But having that record to go back to, being able to remind myself that yes, I made that thing and that after things settle down, I’ll have space to make more things, is actually really helpful. So one of my goals in 2016 is to start afresh, to get back to my camera and sharing what I make. Let’s skip the year-in-review post. 2015 was big – in a lot of really great ways, but also in a lot of ways that were a lot of work. I’m looking forward to using 2016 to get my feet back under me and renew some habits that got interrupted over the past few months. I made a quilt top. This is Cheerio from Thimble Blossoms. I started it around Christmas time, after being inspired by Nettie’s beautiful version at A Quilt Is Nice. 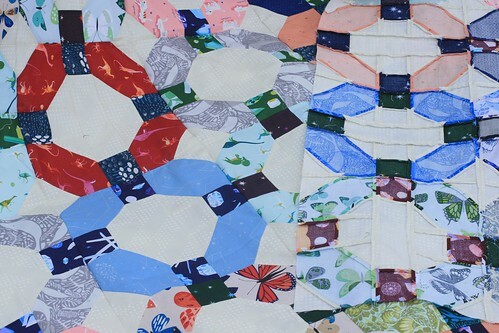 I didn’t set out to copy her quilt, per se, but I really liked her take on it – lots of brights and lots of contrast. It made me take a look at that pattern in a new way, and appreciate how I could use it to make a quilt that suited me. I’ve been keeping my eyes open for a quilt pattern that’s a bit more complicated than my usual (read: not another Donuts quilt), but straightforward enough that the block construction is still intuitive to me. This pattern ticked all the right boxes, and was also a great opportunity to make a dent in my fat quarter stash. 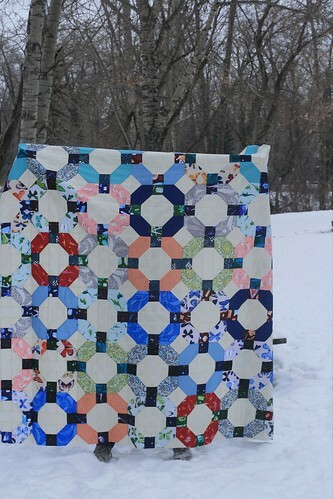 I had to buy fabric for the background – I don’t stash large quantities of neutrals unless I’ve got a clear plan for them – but all of the other fabrics in the quilt are from stash. It’s mostly Natural History fabrics (I got a fat quarter set for my birthday last year), with a few simlarly-themed fabrics mixed in. I decided to add in some “rules” for colour mixing, which helped me keep things cohesive. I split everything into “light” and “dark” piles by value, and tried to use “light” fabrics for the cheerio sides and “dark” fabrics for the squares. I also made an effort not to repeat any fabric pairings, so that each block is unique. 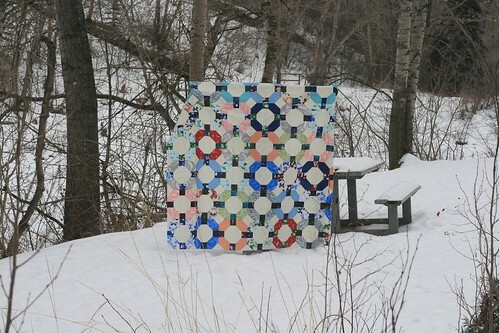 I’m planning to quilt this myself, which is kind of an exciting plan. (This is made possible by the fact that I did two things this summer: bought a new sewing machine, and learned to use the walking foot and machine quilt.) I’m a bit nervous, as this is the biggest quilt top I’ve ever made at 66″ by 77″, but I think I can manage it. So: hello, 2016. I’ve been making things. I’m excited to share them with you this year. I think I know how you feel. I felt like 2015 was so big in so many ways that I kind of lost track of how much I enjoy crafting and documenting it too. I’m just starting to find my way back and remembering how nice it feels.